Individual astrocytoma cells expressing a cytoplasmic form of pl85 c-neu migrated along basement membrane lined surfaces after xenografing fresh low or high grade human malignant astrocytomas into host rat brain. We now study the migratory capacity of fresh human malignant astrocytoma cells seeded on hydrated gel wafers composed of artificial basement membrane or collagen I, a normal and lesion-related CNS extracellular matrix component. Approximately 107 mechanically disrupted cells (with small clumps) of 3 fresh low grade and 6 fresh high grade astrocytomas were seeded on the surface of artificial basement membrane and collagen I wafers (11 × 16 mm). The wafers were then prepared for scanning electron microscopy and immunohistochemstry at 1, 3, 5, and 7 days after seeding. Regardless of tumor grade, a morphologically similar class of cells was observed to migrate through collagen I gels in 24 hours and 0.5–1.5 mm into artificial basement membrane gels in 7 days. Immunohistochemistry revealed that the migrated cells from low and high grade astrocytomas were positive for glial fibrillary acidic protein (GFAP)) and expressed cytoplasmic human-specific pl85 c-neu . 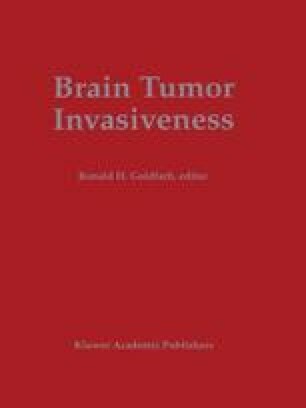 These data indicate that fresh human malignant astrocytoma cells that contain GFAP and express cytoplasmic pl85 c-neu have a high degree of migratory capacity and could be the cell in the tumor involved in intraparenchymal metastasis and poor patient survival in high grade astrocytomas of the human brain.